ICYMI: Captain Marvel's 'Endgame' Ambitions & MCU Absence Come To Light In Latest Tease! We are just weeks away from the release of Avengers: Endgame and the anticipation for the rematch of the century is at an all-time high. Despite knowing the significant players and what's at stake (the reincarnation of the half of life that was decimated throughout the cosmos, basically), very little has been released about how this vengeful rewind will go down. Between the Quantum Realm and time travel, a lot of theories have been popping up online. 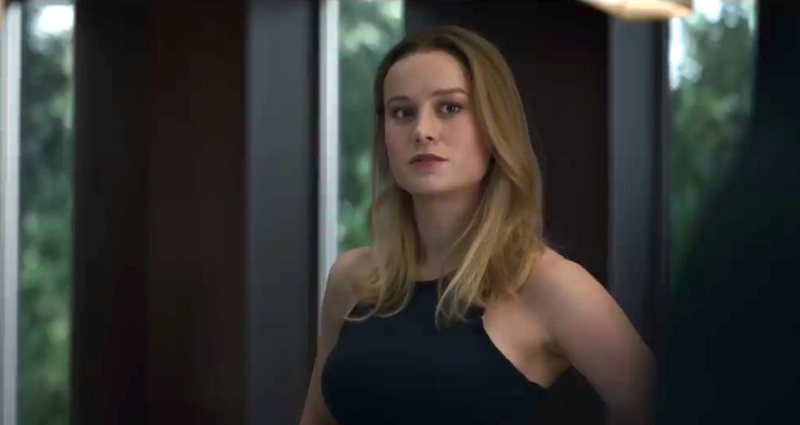 But the first clip for the fourth Avengers film has released, and it features the MCU's newest star Brie Larson getting cozy with her new superhero teammates. Besides bringing Captain Marvel into the mix, the latest tease also shines some light on what fans will be getting when the final chapter in what Marvel Studios head honcho Kevin Feige calls the "Infinity Saga" captivates audiences around the world. The big reveal here is fans finding out that their favorite purple people duster has used the stones once again. For what, could be anyone's guess, it even could have something to do with the time travel theories that have hypothesized. Either way, the Avengers get a ping and know where Thanos's location is. Carol Danvers, being all about that higher faster further life, believes she will give the team the edge against this colossal evil-doer. Mark Ruffalo's Bruce Banner and Don Cheadle's War Machine are somewhat hesitant, what with them being shorthanded as a result of The Decimation, the very thing they are trying to undo. At which point good old Rhodey asks the question that everyone is thinking -- Where was Captain Marvel in 2012 when Thanos's Chituari Army led by Loki attacked New York? Where was she when Ultron almost dropped Sokovia out of the sky? Why was she not given a page when the world's superheroes had a Battle Royale at a German airport? To which she confidently responds by informing the man in the tin suit that she does what the group does for Earth but on a much larger scale. Meaning, Captain Marvel is basically the Avengers of space. After Danvers fills the time gap for everyone, both Chris Evan's Captain America and Scarlett Johansson's Black Widow agree to her plan of taking down the Mad Titan and reversing what he did, bringing everyone back who perished after the infamous snap. With the room split on Danvers's plan, of course, the God of Thunder, Chris Hemsworth's Thor, has the deciding vote. Recognizing the warrior in her, most likely because the two share that same confidence in their abilities to save the day, the Asgardian approves of this plan and summons his new toy, which we all hope he will aim a little hire this time around. Captain Marvel's strategy feels like it probably won't pan out that well and is perhaps poised to happen early on in the film, as several characters are missing from the fold. Robert Downey Jr's Tony Stark And Karen Gillian's Nebula are presumably still off in space, and Rocket Raccoon is MIA as well. Paul Rudd's Ant-Man is also not present. Presumably, after this attempt fails, they encounter Stark and Nebula. Then, upon thinking there is no way to stop Thanos in a fight, Ant-Man shows up, and the journey into the Quantum Realm could begin. The slow-motion shot in those slick white suits is notably missing Captain Marvel but contains the aforementioned missing characters. While Captain Marvel is mighty, her abilities come from the Tesseract, which is the Power Stone, so she may not be as effective as she thinks. She is basically one Infinity Stone, and Thanos has all of them. Benedict Cumberbatch's Doctor Strange couldn't stop him with the Time Stone, and Paul Bettany's Vision couldn't do much with The Mind Stone to even slow down the Mad Titan. A devastating loss like that could serve as a learning point for her character, humbling her and instilling a new sense of responsibility giving her the last push needed to be able to be back on a team. But more importantly enable to trust others after being betrayed by those closest to her during her time on the Kree Space Force showcased in the Captain Marvel film, which recently soared past $1 billion at the global box office. The one thing we know for sure is the Marvel Cinematic Universe's future is looking bright with a lot of Larson on the way. Through most of the previews, any savvy fan can gather that all signs point to the old school making a big sacrifice to save the day, leading the way for a new lineup of heroes to take the reins. A changing of the guard has begun. Evans has hinted that his run as Cap is coming to a close and it's fitting given Larson's has just started. Once the dust settles on Endgame, concerning the MCU, it may be safe to say that she is the Captain now. Avengers: Endgame finally releases in theaters April 26, 2019.